1) 4 pounds of lamb–cut into medium sized pieces. 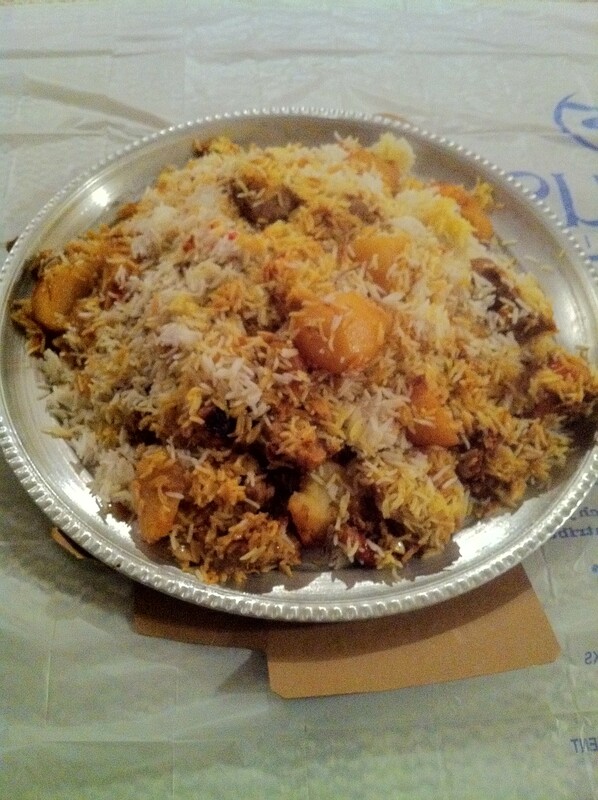 11) Shan Mutton Biryani mix [can buy at your local Indian or Middle Eastern store]. 13) 3 cups of rice–half boiled. Boil the meat in water–you can add a bay leaf to it if you like–until almost tender. In a deep pan add the oil, and once warn sautee the onions until golden brown. Then add the potatoes and let cook for 2 minutes. Add the lamb, 2 tblsp of the Shan mix spice, garlic, ginger, tomatoes, green chilly pepper, yogurt, and 1 tblsp of the cilantro. Let the flavors blend under medium heat for about 5 minutes. Then add a cup and a half of water, and let simmer for another 3 minutes. Preheat oven to 350 degrees fahrenheit. Place in an oven dish, big enough for the sauce and the rice. Place the sauce at the bottom, layer the rice on top, sprinkle with the saffron and about 1/4 cup of water. Cover well with foil, and place in oven for 20-30 minutes when the rice is cooked through. Garnish with the rest of the cilantro and serve with yogurt and cucumber salad, chutney [blend a tomato, green chilly pepper, 3 tblsp of cilantro, lemon juice and salt] and a green salad. No not in this one. We use it in other rice recipes. But in Aden particularly not many like to mix sweet and salty. Thank you for your feedback and thoughts and suggestion. Will check out the Kuwaiti biryani. Happy cooking. It is a wonderful hobby to have and love .